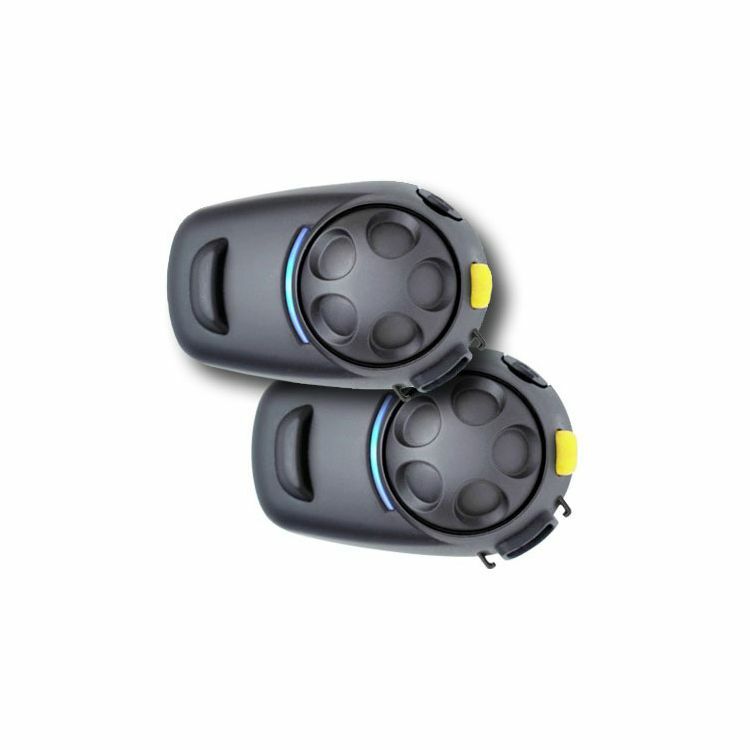 The SMH5-FM is a Bluetooth 3.0 stereo headset with Bluetooth intercom and built-in FM tuner designed specifically for motorcycles. With the SMH5-FM, you can call handsfree on your Bluetooth mobile phone, listen to stereo music or voice instructions of GPS navigation by Bluetooth wirelessly, and have two-way intercom conversations in full duplex with a passenger or other motorcycle riders. Thanks to the latest Bluetooth 3.0 and the advanced digital signal processing technology, the SMH5 offers the best sound quality for both incoming and outgoing sound in its class. Also, the easy-to-access and intuitive button operations make the SMH5-FM a perfect companion for motorcycles. There are almost too many features! We really only use them to communicate when riding together or to listen to music if we ride solo. If we get too far apart or if there is a loose connection (it’s inevitable that stuff gets loose when you take the helmet on/off) the sound can get very crackled. But this set cannot be beat for the value. It would be nice if they included a couple extra pieces to hold the wires in so everything remains neatly tucked away, other than that they are perfect! Used on 5 day 1600 mile ride from southern Ohio to smokies. Worked great. We liked our first set of SMH5s a lot, other than short battery life, so we bought a second set. The second set had static, poor sound quality, and echo. Figuring that set needed a firmware update or different settings, I tried to use the Sena Device Manager. Unfortunately, the Sena Device Manager simply will not work and CANNOT work. It's not just the incredibly poor documentation or the lack of support by Sena itself, and it's not the USB connection because the USB tester that Sena HIDES in the program files says my USB is fine. Not, I finally tracked the problem down to the drivers - the drivers supplied by Sena are UNSIGNED and Windows 10 simply won't accept them. Windows shows that cute little exclamation mark by Sena in my Device Manager because the drivers are unsigned. Yes, these are the latest drivers from Sena and even Windows says that's true, it just won't use them because Sena provides UNSIGNED drivers. And there's no source of SIGNED drivers. Incredible! I just received these a few days back, very fast shipping from Revzilla! The guys I ride with have these on their helmets and swear by them, I knew I needed to get one to get in on the conversations about gas, where we going, who’s hungry, etc while going down the road. I didn’t realize just how much I’d like this but it really is fantastic! I’ve read that others state the bass could be better and I agree, but it is what it is! Makes it a lot more enjoyable being able to talk to other riders, take calls, listen to the FM, or mp3’s off the phone. Setup was quick and easy, about 15 minutes or so and it was done. I have a single SMH5-FM and switch between two different helmets. The device works ok for GPS connectivity and sometimes OK for FM radio. The radio fades fairly quickly and reception is not great. Also, I find it hard to hear phone conversations at anything over 50 mph. My real issue is with Sena customer support. The Sena product page for this products states that you should downloand and run the firmware update for improved function and even has an updated firmware version from just a few months ago. I downloaded the firmware update, followed the instructions, and the update froze at 90%. After letting it run for a while it also froze my computer. After this, the Sena would not even power on. I tried running restore but no joy, the device seemed to be bricked. I called Sena and the first support rep told me she would not help me as the unit was out of warranty and I shouldn't have tried the update (even though sena.com specifically said to update this device.) She refused to help and refused to transfer me to someone else. She told me I was welcome to hang up and call back which I did. I called back and reached someone else who also suggested I shouldn't have tried to update even though a new driver had been released just a few months previously. He told me Sena was not responsible if their driver update ruined my device. He also refused to help me other than telling me to keep uninstalling and reinstalling the driver application and maybe it would work. He then put me on hold and never came back. I spent several hours uninstalling and reinstalling the application and continuing to try hard reset of my product. At some point, after quite a few tries it kicked back on. Ridiculous for such a product. So, thanks Sena for refusing to support your product. Guess I will move on to Scala. Background: This is our first intercom set so this review reflects customer satisfaction for our intended use. We have no basis for comparison to other products. We ride a 2008 Honda Goldwing which provides a pretty quiet ride. Our intercom system does not have to compete with much ambient noise. My intercom is mounted on my full face HJC RPHA 10 and I always wear foam ear plugs when riding. My passenger's intercom is mounted on their full face Nexx XR1.R and they rarely wear earplugs when riding. We purchased these in late September 2017 and have since logged over 3000 miles using them. Review Comments: Although neither of our helmets have OEM speaker pockets built-in, I was able to mount the speakers for a comfortable fit without any modification of either helmet. The speakers in both helmets appear to be mounted low and forward of optimal "center-of-ear" position, but volume and clarity is very good. If the speakers were any thicker I do not know that they could be comfortably mounted in either helmet without some cutout work. Based on advice previously gleaned from a different intercom manufacturer I chose to use the supplied boom microphones (vs. the small stick-on supplied specifically for full face helmets) to take advantage of the ambient noise filtering provided by the foam sock that encapsulates the end of the boom microphone. Our primary purpose for this intercom system was to wirelessly converse with each other (both on the same bike). This product meets our needs with flying colors. Good volume, good clarity, and easy to learn and use for our relatively simple needs. Neither of us has yet tried linking up to our cell phones, music players, or other riders on other bikes. However, I do anticipate occasionally linking with one or two other riders. I chose the SMH5 with the FM option because it is advertised to have a 700-meter range vs. 500-meters for the base model SMH5. The FM option works, seems easy enough to use, and I am personally impressed with the sound quality from these small battery-powered speakers. But in truth, I have only played with the FM option as a novelty. When we wish to listen to the radio we crank up the 80-watt Goldwing system, which can be clearly heard through helmet and ear plugs with the helmet face shield lowered. All I can say about battery life is when starting the day fully charged they were still working fine for intercom use 8 hours later. Again, good enough for our basic needs. And cheaper than any wired or wireless options I found that would work with the Goldwing factory intercom system. Got this for my daughter and I to be able to communicate. We love them! She has mastered the controls for everything in a hour! She loves that she can answer phone and call and I love having the FM radio. Would recommend it to everyone! For the price point, I am glad we got the 5, but for better clarity as you gain distance on the tail, go with the 10. The FM came in very clear and the com was excellent as well. We use these on our modular helmets and have them attached so that they work best when the jaw is lowered. They have some wind interference, but that is when the helmet is full open. I would recommend after a 2500 mile trip and no issues. We charged them daily. Our typical day was 6 hours of use. Very happy with the sena 5 fm. Ease of installation. Good sound and clarity for the price. Purchased for a SHOEI Neotech Large and Vega Medium size helmets. Works fine in both, imagine these would work in almost any helmet. Install requires some time and patience. Both units paired easily to each other and to phone. FM radio reception is good. I'm satisfied with the features, construction materials, and ease of use. There are plenty of mounting/attaching options included. Unit appears durable but only time will tell, especially with the battery. So far zero issues, very happy with product.